Carlie Trosclair (b. 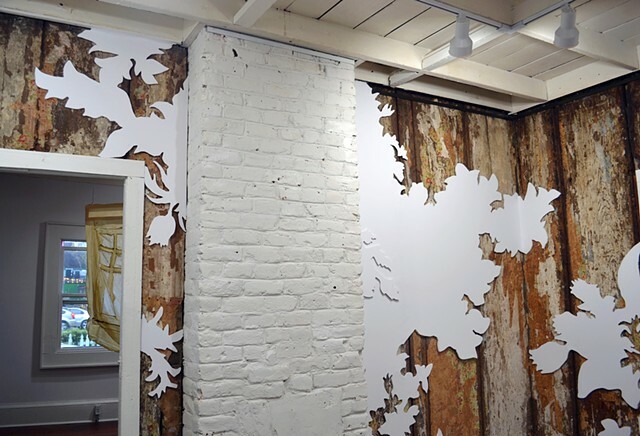 New Orleans, LA) is an installation artist based in St. Louis, Missouri. Trosclair earned an MFA from the Sam Fox School of Design and Visual Arts at Washington University in St. Louis, a BFA from Loyola University New Orleans, and is a Fellow of the Community Arts Training Institute. Approached through a lens of reordering and discovery, Trosclairs site sensitive installations create new topographies and narratives that highlight structural and decorative shifts that evolve over a building's lifespan. Select residencies include: Bemis Center for Contemporary Arts (NE), MASS MoCA; Assets for Artists (MA), Oxbow (MI), Vermont Studio Center (VT), chashama (NY) and The Luminary Center for the Arts (MO). She is the recipient of the Riverfront Time's Mastermind Award, Creative Stimulus Award, Regional Arts Commission Artist Fellowship, and the Great Rivers Biennial. Trosclair was recently selected as an exhibiting artist for the inaugural Open Spaces Biennial in Kansas City, MO curated by Dan Cameron.